The official publication of the Border Collie Society of America, Inc. It is published six times a year, and is mailed free to all BCSA members. Borderlines welcomes and encourages article contributions from both members and non-members. If you would like to contribute an article, please contact the editor in advance of the issue to get your article on the editorial calendar. Submissions must be received by the 15th of the month preceding publication. Submissions received after the deadline will not be published until the following issue, except at the discretion of the Editor as to timeliness and relevance. The publication should be completed, printed, and mailed by the first week of the month following the submission deadline, and delivered by USPS bulk mail within two weeks after that. These timelines may vary due to circumstances beyond our control, but will be adhered to as closely as possible. Writer Guidelines: Please review these Guidelines when submitting an article. 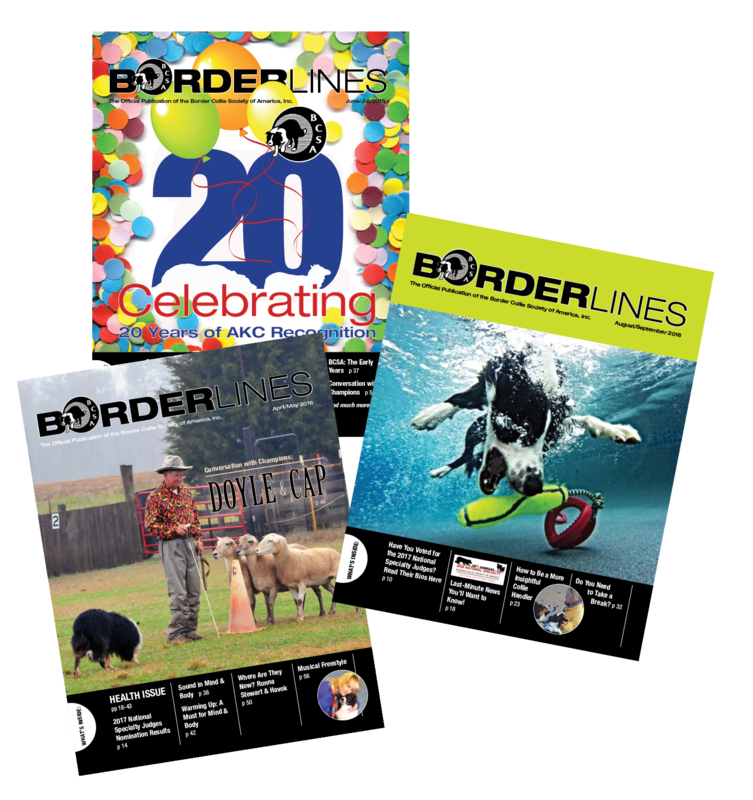 Subscription Rates: Borderlines is published every other month and is available with membership to the BCSA. Subscription rates for non-members are $80 USA, $90 Canada, $100 all other foreign subscriptions. Payment must be made in U.S. funds. To subscribe, please send a check payable to BCSA. Your subscription will begin with the next regular bulk mailing. Extra Copies or Back Issues: You can purchase back issues and extra copies of Borderlines for $5 plus $2.50 shipping/handling each. Please email Kathy Sours to see if copies of the issue you want are available. Advertising in Borderlines is a great way to showcase a new champion, promote an upcoming litter or to memorialize a dear friend. Digital photos or camera-ready ads sent via email are the preferred method of submission. Email to Borderlines Editor at: editor@bordercolliesociety.com or send by US mail to: Cindy Eaton-Eklund, 4309 131st Circle, Urbandale, IA 50323. Please include sufficient postage and an addressed return envelope if you require photos returned via USPS. All advertising must be pre-paid. Use the form below to pay for your ad with a credit card (via PayPal) or send your check payable to BCSA to Adrian Smith, 106 Golden Glen Drive, Simi Valley, CA 93065-7034. Each change to an annual ad contract during the year requires an additional $10 set-up fee. At the November 2006 meeting, the Board approved giving Border Collie rescue organizations a discounted ad rate in Borderlines. The ad rate for rescue organizations will be one half the member rate for both single issue and annual ads. The person submitting the ad must be a member of BCSA for the organization to receive the discount. BCSA recently removed its advertising restrictions and replaced them with the following position statement. It is BCSA’s position that before making a decision on breeding a Border Collie, the breeder should perform all recommended health tests on the dog, as well as evaluate its temperament, and natural working ability and trainability on sheep. Border Collie purchasers should educate themselves on these topics and thoroughly interview the breeder about their breeding practices before making a buying decision on a Border Collie. Depending on whether you are a BCSA member, non-member, or member of a Border Collie Rescue organization, please select the appropriate payment area below. Ad payment will be processed through PayPal. The BCSA Board of Directors and Editor reserve the right to refuse advertising or submissions which are not in the best interest of the breed, the club, or dog sports. Items included in the magazine do not necessarily reflect the views of the Club, the Board, or the Editor. The Editor reserves the right to edit and/or verify all copy. Submissions remain the property of the authors.